What is the purpose of the shoulder strap upper adjustment? On both of my backpacks (40L and 100L) the construction is as in the picture. The shoulder straps are connected to the backpack body at some point A on the back of the backpack. Separately, there are adjustment straps, that connect some upper part of the shoulder straps to the top of the backpack (those are different from the shoulder strap length adjustment at the bottom of the shoudler straps). 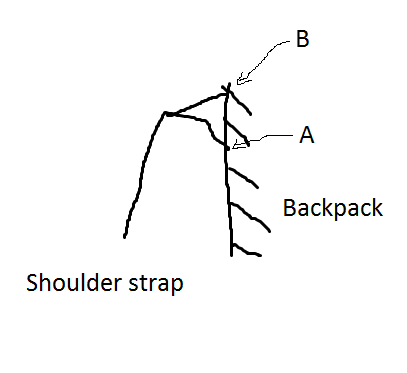 Essentially, if the adjustment straps are fully loose, the shoulder straps are attached to point A, and if they are fully contracted, the shoulder straps are attached to point B. What is the purpose of this? How do I adjust them correctly? Those are stabilizer straps, also known as load lifter or load adjuster straps. You typically have another set of stabilizer straps on your waist belt as well. These straps essentially prevent your bag from flopping around on your back and help balance the load, which will ultimately lift the weight of the bag off of your shoulders and better secure the bag to your back. If you really want to get a sense of how beneficial they are, try going for a hike with those straps completely slacked off, then compare that to hiking with them properly adjusted. Your bag must be properly fitted and packed* for the straps to be fully effective. Adjust the back length on your bag (if it is adjustable) so that the shoulder straps drop about 2" (5cm) behind your back with the hip belt comfortably fastened around your hips. Then adjust the buckles on your shoulders for the stabilizer straps so that they are at about a 45° angle. *You want to balance the weight in your bag so that it will lean more "towards" your body than away from your body. One way to test if you've properly packed your bag (If your bag has a flat bottom), it to rest it on the ground to see how the load is distributed. If the bag sits upright or falls forward, then you have properly distributed your load. If it falls backward, then your bag is going to force you to lean forward more to balance, which will pull more on your shoulders and ultimately fatigue you faster, in which case it would be beneficial to repack your bag. ....This is designed to slightly pull your shoulders back and evenly distribute the weight across your back (i.e. so that the weight doesn't simply sit on your lower back). Pull these tight so that you feel the weight move up slightly (to the middle of your back) and doesn't sit too low. You should feel your shoulders being slightly pulled straight and backwards (imagine your shoulder blades being pulled flat with your back, this should naturally adjust your posture so your shoulders are flatand your back straight). Not the answer you're looking for? Browse other questions tagged backpacks or ask your own question. Backpack is moving from side to side when I walk - is that the way it's supposed to be? Is it possible to “pad” the shoulder straps of backpack? How is a backpack supposed to fit on the shoulder? What would make my backpack uncomfortable? How do I weave the backpack shoulder straps when there are two strap adjusters? What's this backpack part called and how can I get a replacement?